The one natural resource that can never be recovered is time. No, this won’t be article #10 million about Mayweather ducking so and so or being “afraid to lose.” Frankly, those stories are written by people with agendas or by those without any real, working knowledge of how the sport actually works beyond what they see, read, and choose to believe. This will be, however, a testament to what can happen to a fighter who bucks the system and removes himself from the slave-master dynamic that still prevails over the sport today. Mayweather’s career demonstrates the precarious balance in boxing between those power brokers who siphon off a disproportionate amount of the athlete’s money and the kind of abuse you can suffer if you don’t sign up with one of those glad-handing con men. Coming up, there was no way to miss Floyd Mayweather’s talent and boxing instincts. He had the kind of ring presence that it usually takes a lifetime of fighting to develop. There was no denying that the kid from Grand Rapids was a real, honest to goodness, once in a lifetime talent. 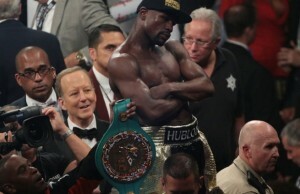 Promoter Bob Arum of Top Rank Promotions had a new star and was telling the world of Mayweather’s impending greatness. At 21, he dominated and disposed of a quality two-time world champion in Genaro Hernandez. About two years later, he got his first super fight against the deadly dangerous and undefeated Diego Corrales– a bigger, stronger and more established fighter who was causing absolute terror among the super featherweights. After dismantling and stopping Corrales inside of 10 one-sided rounds, Mayweather would move up to lightweight and score two victories over an outstanding Jose Luis Castillo. The first contest of the two was close and has been widely debated, but the second was a clear and obvious win. Between Hernandez, Corrales, and Castillo, Mayweather worked over such respectable names as Angel Manfredy, Goyo Vargas, Emmanuel Augustus, Famoso Hernandez, and Jesus Chavez among others. In that period of time, not only did Mayweather win each fight, but he rarely even lost a round. Although his rise to 140 lbs. 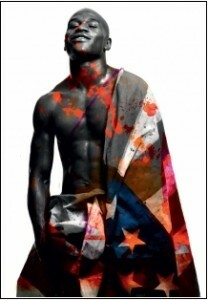 was not without it’s critics, his three-fight stint at that weight class was overall solid as he fought the two highest-ranked available jr. welterweights at the time, DeMarcus Corley and Arturo Gatti. Ideally, Ricky Hatton or Kostya Tszyu would’ve been the names on Mayweather’s stop-over at 140, but Tszyu was hurt and inactive for most of 2004 and was set on a Sharmba Mitchell rematch whenever he did return. Hatton, on the other hand, was UK-based and, at the time, unwilling to travel. Mayweather went ahead with the biggest fights available to him and came away with three more victories before moving up to boxing’s historically glamorous welterweight division. And that’s when the real problems started. Shortly after entering the 147 lb. class, Mayweather initiated a split with promoter Top Rank. After exhausting attempts to stall, block, or placate his young star, Bob Arum went into his back-up plan, reserved for those with the audacity to demand self-determination in the most brutal and unforgiving of all sports. Mayweather had escaped the plantation and Arum was going to sick the dogs on him. The Harvard educated Arum dusted off the lead-footed and possibly plaster-gloved Antonio Margarito, a fringe champion who had only defended his WBO welterweight title four times in over three years prior to Mayweather entering the division, and propped up the relatively unknown Mexican fighter as evidence of Mayweather’s newly-created cowardice. While allowing Mayweather to buy out the rest of his Top Rank contract and otherwise severing all ties with the second generation star, Arum was simultaneously issuing a bogus 8-million dollar offer for his former client to meet Margarito in a bout that neither logistically nor legally could’ve taken place at the time. Arum would go all out in his efforts to humiliate and discredit Mayweather, drilling home his talking points endlessly and nudging a sympathetic boxing media to add fuel to the growing fire. Mayweather could go nowhere without incurring the wrath of a suddenly enraged boxing media, even being battered and deep fried on the usual softball-lobbing ESPN, home of Friday Night Fights. Meanwhile, Arum brought jr. welterweight champ, Miguel Cotto up to the welterweight division to accompany Margarito and Ghana’s Joshua Clottey in Top Rank’s attempt to freeze the new lineal champ out of the picture. Carefully avoiding the WBC, where Mayweather was the reigning champ, Arum deposited his fighters in each of the remaining sanctioning bodies, The WBA, IBF, and WBO, rather than forcing Mayweather’s hand by having them crowd the WBC rankings for an eventual bout. As Mayweather took money fights with Oscar De la Hoya and Ricky Hatton, the Top Rank fighters were being positioned into bouts with one another and against big-named, but recently defeated stars like Zab Judah, Kermit Cintron, and Shane Mosley. Mayweather would take tremendous flack for choosing the 40 million+ that came along with De la Hoya and Hatton despite the fact that Arum tried mightily to secure those same bouts for his dynamic duo of Cotto and Margarito. 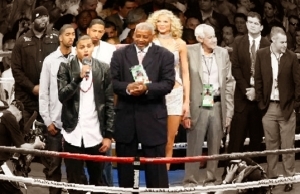 The ball rolled and the publicity push gained momentum, allowing Arum and Arum-friendly media types to level accusations of ducking at Mayweather while the promoter simultaneously set up a Cotto-Margarito battle by matching them up on two simultaneous cards in late 2007 and early 2008. For those interested in fair play and honest reporting, it remains to be seen how one could “duck” someone who was being pushed in the opposite direction all along. After Mayweather’s two-year “retirement,” the players were still the same at 147: Margarito, Cotto, and Clottey and, still, none of them were allowed within sniffing distance of the returning lineal champ. Also on the main stage, following two big wins over, yes, De la Hoya and Hatton, was Manny Pacquiao, the Filipino sensation that had pushed his way to the top after an unlikely run from super featherweight to welterweight in only 14 short months. For those doubting Mayweather’s desire to fight Pacquiao, please note his choice of Juan Manuel Marquez, the last fighter to give Pacquiao a serious challenge, as his comeback opponent as well as the obvious move of announcing his comeback on the very day of the Pacquiao-Hatton contest. 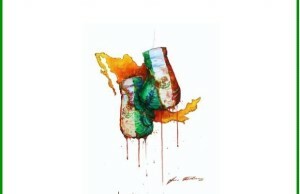 Mayweather predictably beat Marquez; Pacquiao beat Hatton and then Cotto. But the Mayweather-Pacquiao Mega Fight would never happen. Killed by Mayweather’s demand for random blood testing and Pacquiao’s panicked, litigious refusal to be tested, the bout drifted away until it was brought back as a figment of Arum’s fertile imagination several months later. After the first round of talks had drowned in a sea of legal proceedings and hurt feelings, Arum, who insisted that a deal between Team Pacquiao and Team Mayweather had been reached this second time and that the only thing missing was Mayweather’s signature on a FedEx’d contract, issued a public deadline for his former associate to sign. However, as Arum confirmed later, he had never actually spoken to anyone from Team Mayweather directly nor had any of the issues surrounding the drug testing been resolved. So, let it be a testament to Arum’s ability to manipulate public opinion that he somehow convinced a good number of otherwise smart boxing fans that he had been negotiating in good faith with, literally, nobody and that it was still Mayweather’s fault that the fight didn’t happen. Pacquiao, like Margarito before him, was free to fight whoever he wanted without having to deal with the ghost of Mayweather and, perhaps most importantly in Pacquiao’s case, the spectre of his frantic avoidance of random blood testing when the issue came up the first time. Mayweather would fight and beat Shane Mosley, who had destroyed Antonio Margarito 14 months earlier, while Pacquiao drifted in the opposite direction, beating Clottey and then a recently re-instated Margarito following his infamous plaster-gate scandal. Now, Mayweather is pretty much out of the game and, almost literally, frozen out of the picture by Bob Arum while Pacquiao is booked to face Mosley in May. The only real option for “Money” is a bout with Andre Berto, a fighter deemed too unknown to sustain a PPV by Arum, or a move to 154, well above his comfort zone as a fighter. If Mayweather had never left Top Rank, things would’ve been decidedly different and we’d be talking about a fighter on the fast track to all-time great status rather than one who is a real and bankable draw, but can’t find an opponent and, at this point, doesn’t even really seem to care anymore. Of course, Mayweather isn’t some poor, innocent soul in all of this. He has made some major career mistakes, especially in recent years, and is as dumb when it comes to public relations as he is intelligent in the ring. Contrary to his own obvious belief, the persona that he’s created for himself as some sort of new age hip hop villain, is not only unlikeable, but downright tedious. If Mayweather set out to never again get the benefit of the doubt in any debate, then he’s done his job. And his team of yes men and hangers-on will ensure that things aren’t likely to change. But, still, you can’t help but feel sympathy for a man who has been played like a violin by the often-evil genius of Bob Arum. Especially considering that, inside the ring, Mayweather has been nothing but respectful to the sport. Arum has so cornered Mayweather, from a career perspective, that any move will be a bad move for the 5-division champ. Arum holds all the cards and it has become obvious that he’s not willing to even allow a hand to be dealt to Mayweather at this point. “Money” has his money–and plenty of it, but real professionals also want the respect that comes with perfecting a craft…He’s not likely to get much of that for the rest of his days in and around the sport. Plagued by politics and burdened by his own ambivalence, Mayweather’s prime years have been spent mostly inactive and against fighters well below his own level. Who you point the finger at depends on your own personal take on the issue, but all serious fight fans can sympathize over seeing a fighter never become what he should’ve been.